What I like most about this is the weight of the base and the clock design. Was not poorly priced either. I bought the brown. Has a nice patina. Would recommend if you want something nice to hold that umbrella. 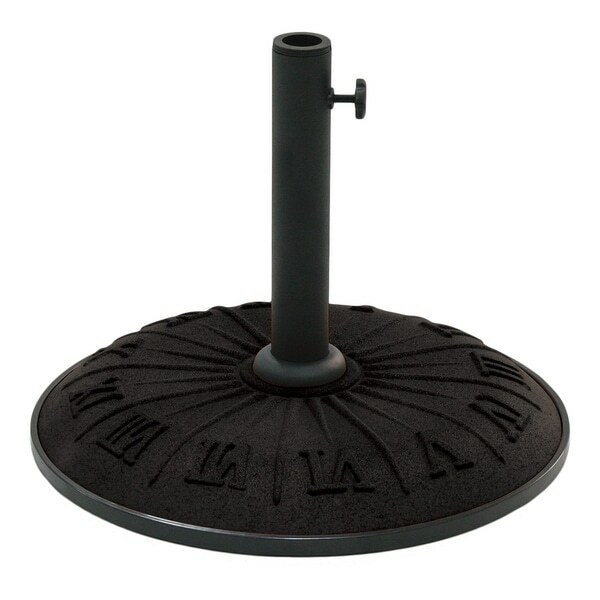 The International Caravan Roman numeral umbrella stand is a great addition to a patio thanks to its functional and sturdy construction. Measuring 18 inches wide and weighing 35 pounds, this stand ensures that your umbrella will stay put even in moderate breezes. Available in several attractive shades, this umbrella base gives any patio set a stylish upgrade. The clock-like design around the border is also a great conversation starter. Dimensions 4.0 In. X 21.0 In. X 23.0 In. The black umbrella stand is heavy and very attractive with the raised roman numerals. Assembly directions contains diagrams only. Words would have been helpful. 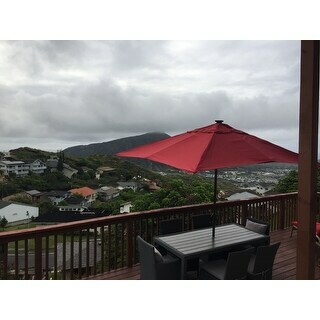 There is a plastic sizing insert which allows the use of umbrellas with poles of varying diameters. 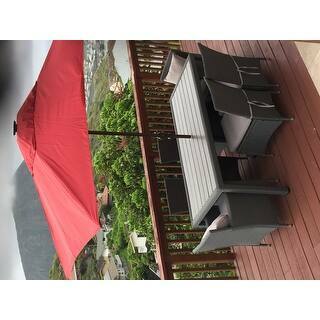 I ordered this stand to help stabilize the umbrella I also purchased from overstock. My table has a hole for an umbrella, so I was hoping that this stand would provide the additional support needed to keep it from moving around in the wind. Honestly, I thought this stand would do a better job of holding the umbrella in place when the wind picks up at my house, so for this reason I gave it 3 stars. The stand does come with two plastic inserts (that can be removed) if the pole on your umbrella isn't as thick as it needs to be to fit in this stand. I didn't have to use either of the inserts but this is a nice feature just in case the next umbrella I purchase doesn't quite fit. The stand went together easily and is sturdy enough to hold the 10' umbrella. Note - at first I thought the umbrella's post was too large for the stand, but after my morning coffee I realized there was a removable insert in the stand. When I removed the insert the umbrella fit like a glove. Love it! The umbrella stand was easy to assemble and is very heavy. Appears to be of good quality. This umbrella stand is very heavy and sturdy. The color is nice and the Roman Numerals add a nice touch. Yes, I would recommend this to a friend. Great, heavy stand. I like the subtle Roman numerals as decoration. It was very easy to put together. Very pleased with this product. This is a very heavy and sturdy base for my umbrella. I don't have to worry at all about it tipping or moving. I also like the look of the roman numerals, they remind me of a sundial. Warning: Yellow is not actually yellow! The umbrella stand is heavy/sturdy and works well for the umbrella I ordered. HOWEVER: The mustard yellow shown in the picture online is VERY different from the color of the stand in person. In fact, I would never call this umbrella stand yellow at all. It exactly matches my husband's college apparel, which is burnt orange. I'm really disappointed with this product because I would have ordered a different color or brand or something had I known the actual color would be so different than what was shown online. Based on that, I cannot recommend this product because it's not what I thought I was ordering. I live in Southern California where the summers are hot and the Santa Ana winds strong. 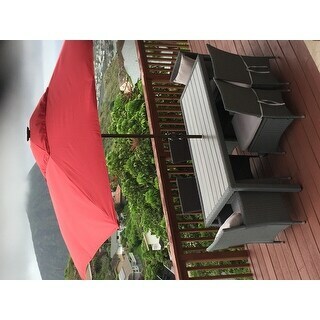 I keep my wind resistant umbrella in a partially protected area on my patio year round and need an umbrella base that will keep it secure during our windy days. I have had the base for one month now and feel confident that it is heavy enough for a strong wind, however If I were to place it in an unprotected area I would purchase a cement base. I purchased the black base and I am very pleased with the resin not leaving rust marks on my patio. I also wanted a solid base so I would not have to contend with leaves and dirt getting into the base. stand arrived in broken wet box, missing pieces. We had to go get screws, and finally got it together, but it is quite wobbly. Would not buy again. Highly recommend. Attractive stand will compliment your deck or pool area. I wanted something to hold down the umbrella's, as we get gusts of wind.These are so heavy and well made. Don't have to fill with water or sand. They have rubber on the bottom so won't come in contact with deck. I'm happy. This was beautiful and heavy. We have had it now one year and I am still loving it. The only glich is that it faded. I was not prepared for that.........but other than that. An excellent product. I would purchase another one. Love this. And for the price, I can't complain. We bought this in 2016 and it is still holding up pretty well. It is quite heavy so it does it work. Still no rust even though we left it outside (rain, snow, sun). Pretty good but a strong wind and it blows over. Best umbrella stand! Very heavy and stable - my umbrella isn't going anywhere! Super pleased with this purchase! The color blends well with everything and the weight is so heavy a tornado wouldn't be able to move this thing! Well made but too tall to fit under my table.....not worth returning with the return charges. I really love this umbrella stand! It is very heavy & does a great job of keeping your umbrella in place ~ especially when it’s a windy day! "How much does this base weigh?" "I received the umbrella today and am having issues with the umbrella pole swaying back and forth from the bottoms of the base. I followed the instructions to assemble the base to the piece that holds the pole and no matter how tight I get it, once the umbrella is inserted it rocks back and forth. The pole itself is secure. It's the base and base holder rocking. " If the pole is moving inside of the mounting pipe then wrap some tape around the bottom of the pole. Just enough to keep the pole from moving within the pipe. If the entire pipe is moving then the pipe to base attachment screw is loose. Turn the base upside down and see if there isn't a slotted screw in the center that holds the mounting pipe to the base. Tighten this screw up while holding the pipe with your hand. Hi. I had the same issue,, so I twisted the base pole while holding down the base firmly. Hope this helps. "I have purchased the christopher knight outdoor adjoining chair item#15994613 and your solar umbrella item # 17313118 and now I need a stand. Will the roman numeral stand fit under the bottom shelf of the table"
Hi Joyce, Please keep in mind this is just my opinion, however, I purchased the roman numeral stand. It was a nice piece. VERY VERY Heavy. But, it's 18 in diameter made it rather large which is great for stability sake. But I think you are wondering if it will fit underneath the adjoining chair unit you just purchased. I don't know for certain, but I tend to think it will be too large where the 2 front legs of the chairs meet . It might be great for the rear portion of the chairs but it may not fit the front. For the amount of $ this stand costs, why would you want to place it beneath the lower table where you can't appreciate the detail on the stand? Save some $ and buy a lesser expensive, smaller base unit. Again....just my opinion, but hope to have saved you some stress. It fit under mine easily. There wasn't a lot of room....but this isn't very high. All fit beautifully. And it weighs enuff to work as it should. "what size umbrella pole does this base fit?" This lovely stand will accommodate up to a 1.5 inch pole. "What is the outer diameter of the tube that holds the umbrella? I need a stand that can hold a 1.5" umbrella, with outer diameter of the tube being smaller than 2 and 1/8 inch. Thanks, J"
"How tall is the pole from the surface of the deck or patio?" Hello Katie, the pole is approximately 12 inches high. Thank you for shopping with us. how heavy it is and the unusual design.